If you’re looking for a pubs in Whitby you won’t have far to look! For such a small coastal town it really does have more than its fair share and according to recent reviews the vast majority of Whitby pubs are well worth a visit. Unfortunately because of the sheer number of pubs in Whitby it would be impossible for us to mention every single one of them here. So, we have chosen what we consider to be the best pubs in Whitby based on both local and tourist reviews. If we have missed any important names out then please do leave a comment below. We would love to hear your opinions. Many of the pubs in Whitby have retained much of their traditional character, with good ale, friendly landlords and top quality pub grub thrown in as well. The Whitby pubs and inns located along the West Cliff and East Cliff are particularly popular with visitors and locals alike so they do tend to get busy during the evenings and from Friday lunch until Sunday. 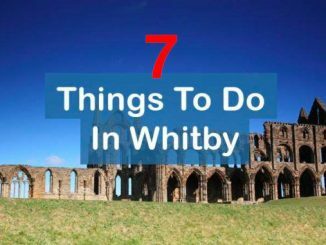 Many of the Whitby pubs mentioned below are child friendly although because of they do get very crowded at times families may benefit from visiting the quieter pubs. Slightly set back from the quayside, this pub is possibly the most traditional pub in Whitby. It hosts a good selection of ales at a reasonable price, it’s not so busy that you have to stand but is busy enough to have a good time, the entertainment includes a TV, pool table and juke box, and the landlord/landlady are equally as friendly as the locals that frequent it. The Star Inn is also dog friendly and child friendly. They don’t serve food though…just good beer and good company. Again, this is a very traditional and busy pub that appeals to both visitors and locals throughout the week. Known for its quality live music acts, the Elsinore provides a lively atmosphere that makes you feel welcome from the minute you walk through the door. Do note though that most weekend evenings will see you standing rather than sitting on a comfy bar stool and queuing for your next pint. If you’re looking for somewhere to watch a big sporting event then this is the pub for you. The Little Angel has invested in state of the art 3DTV equipment to make match night perfect (and what’s more you’ll normally get free food with your beer). Saying this, many of the pub’s traditional characteristics still remain and according to reviews the food is absolutely fantastic. Not over-priced and set in a lovely, friendly atmosphere the Little Angel should definitely make it onto your ‘must visit’ list. This traditional Whitby pub has something for everyone, making it popular with partygoers, locals and families alike. With its big screen TV, live sporting events, live music acts, pool table, excellent food, good ales, decent prices and family friendly atmosphere you can’t really go wrong. It’s the perfect place to sit with a pint and watch the sun go down over the harbour in the summer. Located on the East Cliff it is a bit of a trek from the popular hotels on the West Cliff but it’s definitely worth the journey. Serving a great range of guest ales this popular pub attracts beer connoisseurs from far and near. Loved by the locals, it has a friendly atmosphere and is always busy. Live music acts perform at the Station Inn most evenings, making it the go-to spot for the younger generation. Don’t worry though as by 9pm the revellers have moved on leaving the party atmosphere behind in the pub for all to enjoy. Whitby is fast becoming a real family orientated destination and as a result a lot of the pubs in Whitby now cater for younger family members. Obviously not every pub in the area will be child friendly but the ones listed below definitely are. This particular pub is warm and friendly with great views of the Eastern side of Whitby. Although it doesn’t have a kitchen and hence doesn’t serve food (except bar snacks), the landlord encourages visitors to bring their own picnics or fish and chips in. Children and dogs are heartily welcomed making it a lovely place to stop for lunch and a quick pint. This is one of the only true family-orientated pubs in Whitby and truth be told children love the atmosphere. The food is good quality, with a full child’s menu, but is considered a little bit more expensive than other pubs in Whitby. With its lovely views of the lower harbour you are guaranteed a quiet, pleasant atmosphere for a family afternoon/evening. Situated at the end of old Church Street, The Board Inn offer a warm and friendly welcome to everyone. Go in and enjoy the splendid views over the harbour as you quench your thirst. They have a selection of fine Ales and Lagers and are listed in the 2010 Good Beer Guide. Described as a quaint pub, the Golden Lion has novelty tables in the front room covered in old pennies, which is always fun for children. It has a quiet atmosphere and is perfect for youngsters as they can make themselves at home in the front room. As the weekend approaches though the Golden Lion does tend to liven up with the weekend evenings being really quite busy. Known for its exceedingly friendly atmosphere and landlady who loves to tell visitors about the history of Whitby, the Pier Inn is a lovely place to enjoy a quiet pint on the terrace whether you have youngsters or not. Again, at the weekend when the live music acts are booked the pub can become crowded but during the week it’s a great family pub. Everybody loves the Ship Inn because it simply is one of the friendliest, happiest pubs in Whitby. A big favourite with the locals, they love to meet new people and everyone is welcome, even the loudest of children. Fishermen in particular love this pub so be ready for some cheeky banter and a right good laugh. Whitby isn’t all about traditional pubs anymore and over the last few years several contemporary pubs have become increasingly popular. Although these pubs are still very much the regular haunts of the younger generations they are very much worth a visit, especially if you fancy a break from the traditional pub scene. This particular bar has only been in business for about 8 years, which makes it still brand new when compared to the majority of Whitby. It’s a fun mixture of café, cocktail bar and restaurant and offers a light, friendly atmosphere and a good range of drink options. In fact, Harry’s Bar is known throughout Whitby for its huge selection of available drinks, which incidentally include nearly 20 varieties of cocktail, 11 champagnes (ranging from £35 to a staggering £240 per bottle), 9 white wines, 9 red wines, 2 rose wines, 12 boutique beers, all the popular spirits and 5 varieties of coffee! Something for everyone wouldn’t you say? Opened by the present owners in 2008, The Marine offers a similar selection of drinks to Harry’s Bar. According to their website you can either sample the exciting cocktails, wines, spirits and beers in the modern bar area or take full advantage of the evening by enjoying a delicious seafood meal accompanied by your favourite tipple. One of the best features of the Marine is its location on the harbour side. After all who wouldn’t want to sit sipping a cheeky cocktail while lapping up the beautiful sea views? If you’re looking for an ultra-stylish bar to spend your evening in then this is the place to be. With right angles replacing the traditional curves and modern colour schemes, The Moon & Sixpence definitely fits the description of contemporary bar. Again, the range of drinks on offer includes cocktails (two of which are only available before noon! ), wines and spirits, beers, coffees and fruit juices for the underage drinkers. And if that isn’t enough to tempt you in then consider the offer of 2 for 1 on cocktails between 4-6pm (excluding Saturday). Because Whitby is such a welcoming place there isn’t really anywhere to avoid. There are a few ‘traditionally local’ pubs (The Jolly Sailors, The Fisherman’s Club) where you may feel slightly uncomfortable but this doesn’t mean you should avoid them. 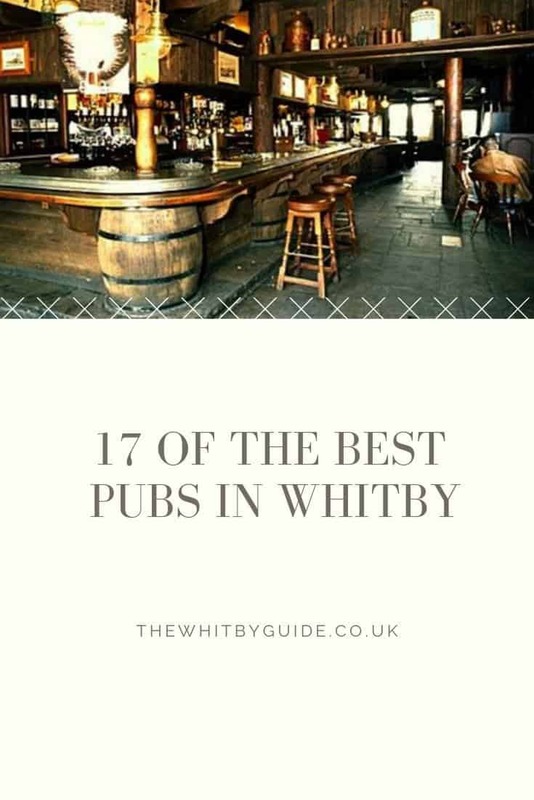 So hopefully we’ve given you a few ideas regarding where to eat and drink in Whitby but remember, this list includes only a very small number of the pubs in Whitby. Do feel free to wander around the town and find your own favourite drinking hole, but don’t forget to pop back and let us know all about your experience in the comments below. Happy drinking! Is Whitby a nice place to stay for a week, are there lovely pubs and restaurants in town. We are in the process of looking for a nice guest house for July next year any recommendations please many thanks Alan from London. Thanks for the ideas. Has anyone used the met bar ballroom for functions or the rifle club? What did you think? Hi Yvonne, thank you for your comment. The Abbey Wharf is a personal favourite of mine also, especially when the sun is shining and you can sit out on the balcony. There is nothing better than spending an hour soaking up the harbour atmosphere. Im looking for a function room for hire in october for a wedding part in the evening. Needs to be child and possibly dog friendly, clean and that will let me hire a band/ music for the night for around people? Any ideas? I like a nice traditional pub but open to any suggestions! !